A4 Size 7.3 x 9.5 in. (186 x 240 mm) 8.3 x 11.7 in. A4 (Mounted) 7.3 x 9.5 in. (186 x 240 mm) 11 x 14 in. A3 Size 10.7 x 13.8 in. (272 x 352 mm) 11.7 x 16.5 in. SMALL 10 x 12.9 in. MEDIUM 16 x 20.7 in. (406 x 525 mm) 18.5 x 24 in. This painting by Kiran Joshi is based upon an original composition by Siddhimuni Shakya, and shows Sristhikanta Lokeshvara, the 'Glorious Creator, Lord of the World', surrounded by fourteen of the great Brahmanic deities that he has manifested from various parts of his body. Sristhikanta is beautiful, peaceful and red in colour, and stands gracefully upon a moon disc and pink lotus within a tranquil landscape. He is adorned with the five divine silk garments and eight jewelled ornaments of a bodhisattva, and wears his characteristic emblems of a serpent necklace and an antelope skin that is draped over his left shoulder. With his lowered right hand he makes the boon-granting varada-mudra, and with his left hand he holds the stem of an immaculate white lotus. 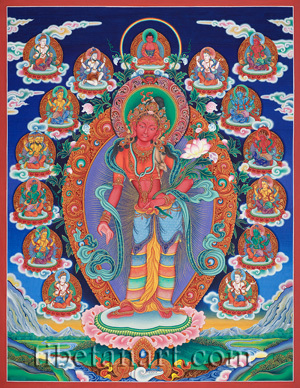 His radiant aura is encircled with budding lotuses and directly above his halo is Amitabha Buddha, the 'Lord of the Padma Family', who is encircled with an orb of rainbow light. All of the fourteen Hindu gods and goddesses that surround Lokeshvara are depicted in similar postures, with their principal hands palms-folded in adoration as they kneel in supplication upon their cloud-borne moon discs and red lotus seats. To the upper right and left of Lokeshvara are the two-armed forms of the white Moon-god Chandra, and the red Sun-god Adita, who were respectively emanated from the right and left eyes of Lokeshvara. To the right of Amitabha is white Mahadeva (Shiva), who is three-eyed, bearded, adorned with a serpent, crescent moon, and a tiger-skin loincloth, and holds a damaru and trident in his upper right and left hands. Mahadeva, the 'great god', was emanated from the forehead of Sristhikanta Lokeshvara. To the left of Amitabha is the white river goddess Sarasvati, who holds her attributes of a crystal rosary and a book of knowledge in her upper hands. As a wisdom goddess Sarasvati is connected with the faculty of speech, and thus she was manifested from the teeth of Sristhikanta Lokeshvara. Directly below Mahadeva and Sarasvati are yellow Indra and blue Yama, who are usually identified with the right and left arms of Lokeshvara. Indra is depicted with his horizontal third eye, and holding his attributes of a vajra and a parasol in his upper hands. Yama, the semi-wrathful 'Lord of Death', has upward-streaming tawny hair and is shown holding his attributes of a club and a rope-noose in his upper hands. To the right and below Indra is four-faced yellow Brahma, who is bearded and holds his attributes of a rosary and a Vedic text in his upper hands. Brahma was emanated from the shoulders of Lokeshvara. To the left and below Yama is the red fire-god Agni, who is also semi-wrathful, with upward-streaming tawny hair and a fiery halo. Agni holds his attributes of a fire-oblation ladle (shruva) and a water-pot (not shown) in his raised right and left hands, and as the god of fire he was manifested from the navel of Lokeshvara. Directly below Brahma is green Vishnu (Narayan), who was emanated from the heart of Lokeshvara, and is shown holding his attributes of a golden chakra and a white conch shell in his raised right and left hands. Opposite and directly below Agni on the left is yellow Mahalakshmi, the goddess of prosperity and good fortune, who was emanated from Lokeshvara's left knee. She is shown holding her golden attributes of a powder-container (sinhamu) and a mirror in her upper right and left hands. To the right and directly below Vishnu is the yellow wealth god Kubera, who has a moustache and a somewhat corpulent physical form. Kubera was emanated from Lokeshvara's right knee, and he is shown holding his attributes of a silk parasol and a golden club in his upper hands. Opposite and directly below Mahalakshmi on the left is the green wind-god Vayu, who was emanated from the mouth of Lokeshvara, and is shown holding his attributes of a silk parasol and a rope-noose in his raised right and left hands. At the bottom right and below Kubera is the two-armed white earth-goddess Prithvi, who manifested from the soles of Lokeshvara's feet. Opposite and below Vayu at the bottom left is the white water-god and serpent-king (nagaraja), Varuna, who was emanated from the abdomen of Lokeshvara. Varuna holds the attributes of a serpent and a water-pot in his raised right and left hands, and his head is crowned by a canopy of five naga-serpents, which are coloured blue, yellow, red green and white to represent the five different castes of the nagas. In front of Lokeshvara's lotus throne at the bottom centre are the sense offerings of a mirror (sight), a conch shell filled with perfume (smell), a pair of cymbals (sound), and a silk ribbon (touch).